You guys are killing me with the comic sans!! But great blog post! kudos! 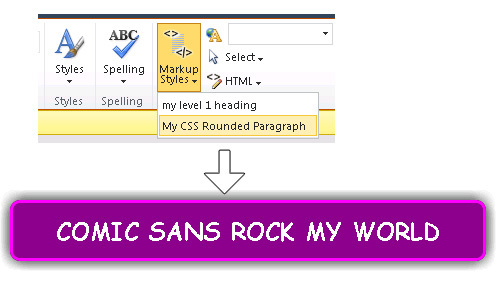 Comic Sans – That’s the only font I’ll use from now on. You guys rock! Once I realised that this is great for “Everything but IE” I had a quick hunt around and found this – http://css3pie.com/ – works alongside the -WebKit and -moz functionality and kicks the goals I want. Useful for people developing solutions for clients with an IE install-base. Great article~! But how can we open up the page layout containing the HTML editor at the first place? This is great, I got this working as described for the Rich Html Field in a page layout, but how do we show the custom styles for the Content Editor (Rich Text) web part when inserted by the author? To add custom HTML tags such as meta description, keywords, and titles, you will want to edit the page in SharePoint Designer. We first need to start be verifying the existing page and template are in good form and readable by SharePoint. Skipping this step can lead to erroneous error. 3) Goto Design View — This will test the pages and all problems denoted need corrected. 4) Go to code view and add the custom Title in “asp:Content “ named “PlaceHolderPageTitle”. This should be the TITLE Content /TITLE, omit the title tags. 5) META Description goes in the “asp:Content” named “PlaceHolderAdditionalPageHead”. This will be the actual HTML code. When I followed the directions provided by others, I had a small problem in the ASP which provided an accurate error by following steps 1-3. 4) Go to code view and add the custom Title in “asp:Content “ named “PlaceHolderPageTitle”. This should be the Content, omit the title tags. How about the Position dropdown (Fin: “Sijainti”) for an image: which styles belong under that? I made a test and I got the button blank now. Image *Styles* I got back by finding and adding appropriate styles from the original htmleditstyle file. But I thought the original ms-rte-Position-1, -2, and so on would be about the Position button. I renamed them according my new file, but the button stays empty. I’ve looked up the table styles in the above mentioned css file. And have tried to define my own set og styles. Which works like a charm. But for some reason, I cannot get the table styles to show in the table style menu. My prefix is added and the styles I have added are there, but I cannot select among them in the menu. Any ideas? Thank you, thank you, thankyou. Have been trying to get my custom styles in the drop down for weeks and this is the only article that mentions that the css style needs to have “Style” appended to the custom style prefix in order for it to appear in the list. Something so simple, yet Microsoft make it so frustrating…grrrr. Anyone know how to let the content author remove a style/markup. I can get the styles/markup into the dropdowns, but i can’t remove the inserted class, without going into the html-Edit html source dialog. I am developing website with a customized masterpage. As I did not use a pagelayout for the site. I need to change default font size for the wiki pages of the site I am community manager in my (large) company. Verdana 8pts is definitly unreadable ! Does this post permit to do it for my site only or will other sites be impacted as well ? My IT department told me that it is impossible to change default font for my site without changing it for others. What do you think ? Thierry, you could change the font by using an alternative css for that site(with publishing features enabled) or just add a few wiki-page specific common css rules for your default css. Use your browser of choice and fire up developer tools to look for common elements only visible on the wiki pages and override their default styles on your own custom stylesheet. Needed to send you this tiny observation so as to say thank you as before just for the precious concepts you’ve contributed on this website. This is so shockingly generous of you giving unreservedly exactly what numerous people would’ve offered for sale as an e-book to help make some profit for their own end, and in particular now that you could possibly have tried it in the event you desired. The strategies in addition served to become a great way to be sure that most people have the same interest really like my personal own to learn significantly more on the subject of this issue. I’m certain there are lots of more pleasant opportunities ahead for folks who view your website. I have this working for my customer but now he wants one of the styles to be the last in the drop-down. In the special CSS file, I have it as the last entry but SharePoint Does not care. Anyone know how to force an order? I am trying to achieve same functionality for Wiki page library. I have modified EnterpriseWiki.aspx in sharepoint designer and have added the PrefixStyleSheet=”my-rte” in the same. My CustomStyle.css file is stored in the StyleLibrary. I have added class as mentioned above for hte rounded paragraph in my css. When opening page in edit mode from wiki page library. It still shows the preexisting styles. and doesnt show up the style as described above. Am I doing something wrong ? Please help! In addition they have a wide range of parts you can purchase. of Canada’s leading GREEN specialty contractors in Asbestos Removal, Demolition and Disaster Recovery,. The four latest artworks include ‘The Trunk’, ‘Franklin and Chop’, ‘Stop and Frisk’ and ‘Vinewood’. Striped candies and the color bombs are your friends here. so that you can clear entire rows and columns when detonated. Then may take some practice, but it is definitely worth the effort. tools to serious gamers that want to develop new video games. Social video games are moreover extremely popular on this website. If possible try some more and let your head touch your knees, again without bending your knees. with solid performance in a price that will not break the bank. had a score of 9952, with an Intel DH55TC a score of 9132. Full Load System Power (Watts). newborns and occasionally seniors at your home. there must be at least 1 staff trained in CPR and 1st Aid. SharePoint 2010 Rich Html Field | SharePoint Blues < Loved it! over the past few years especially since they can now be played at ones convenience. of course the Gator Chomp and the mighty Tim Tebow. A number of them are rife with spelling issues and I find it very bothersome to tell the reality nevertheless I will definitely come again again. it. It really is a lot convenient to use the IMVU credits you make in PrizeRebel. redeem, you can redeem it through winning prize part. you make use of the credits you earned in IMVU. They are basically an audio file (mp3) plus a graphics file that you play at the same time. your pads and reduce the life of them. This article will be discussing one of the best games for game consoles of this company. A new Themes mode includes drawing, photography and voice acting challenges, letting you share your creativity with friends and family. revival of the video game industry after the video game crash of 1983. You mustt continue your writing. I’m sure, you’ve a huge readers’ base already!